A new day has dawned for those who want a complimentary therapy for their respiratory problems. 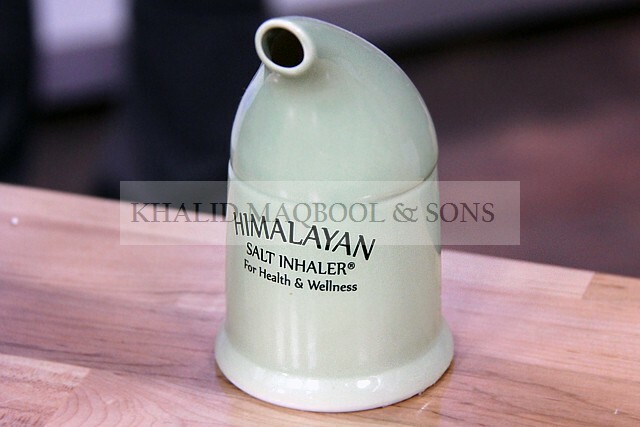 The revolutionary Himalayan Salt Inhaler brings the benefits of salt mine therapy right into your home.In a recent study involving people with severe breathing difficulties – 73.9% of those patients indicated a positive pulmonary response from use of the Salt Air Inhaler or Salt Pipe Himalayan salt is thought by many to have antibacterial, anti fungal, and antimicrobial qualities and is used to improve respiratory ailments worldwide. As you inhale the micron-sized salt particles, they penetrate the respiratory system for beneficial results. The Original Himalayan Crystal Salt Inhaler is a convenient, drug-free and non-invasive device designed to let you inhale the Original Himalayan Crystal Salt vapours that deliver amazing, natural respiratory relief. The ceramic salt inhaler contains hand-mined, dry, pure salt from the Himalayan Mountains. This incredible salt contains 84 ional minerals and trace elements needed for optimum health. The bottom of the inhaler contains the salt, which is placed between two porcelain filters. How do you use a Salt Inhaler? A salt inhaler is very simple to use. It comes with plenty of Himalayan crystal salt, and you fill it from the bottom by removing the silicone plug. Make sure to wash the salt inhaler thoroughly when you first get it to make sure all the dust and debris is out. The salt inhaler must be completely dry before filling and using it. 1. Just pour about 2.5 ounces of the salt into the bottom fill hole. You should use up about 1/3 of the bag that is supplied. 2. Now replace the plug and your salt inhaler is ready for use! 3. Place the salt inhaler to your lips and breathe. For best results breathe in through the mouth, and exhale through the nose. Try not to exhale back through the salt inhaler because this will stop the fresh air from coming in. 4. Repeat this process for about 15- 25 minutes, and repeat daily. I recommend doing this year round, and try to continue to do it every day. I take a day off every here and there, and when I pick it back up the next day, it feels amazing. If you need to refill (or exchange) the salt in the inhaler, simply open the round plastic stopper and empty out the used salt and refill with the fresh coarse Himalayan crystal salt. Plug the stopper back in.